← Thoughts on owning a Nook after a month or so. 1. So, our Reading Room is currently under construction. We’re getting new carpet! Please note that as a result, the bulk of our collections are inaccessible this week. I’m working from the Reading Room. And working is a relative term, since I have no access to any files on my work desktop. 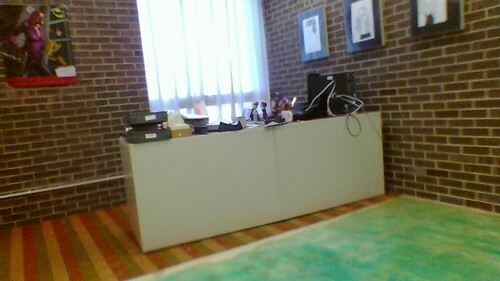 Here’s your proof, a picture of my office from this morning. Note the vintage carpet being replaced, which was original to the building in 1977. More pics in the photoset here. 2. Flames Rising reviewed Chicks Dig Comics over the weekend, too. 3. This is, of course, post-WisCon. Which was Awesome. and EPIC. And I’m still recovering. My panels went well. Plus, gelato and many other Tasty Foods Unavailable In DeKalb were consumed, which is always a good thing. The dessert salon was lovely, as always, as were the GoH speeches. I got to give away the Tiptree Award (money! chocolate! a tiara! art!) to Andrea Hairston (while wearing the Hugos dress again). This was great fun. And if you haven’t read Redwood and Wildfire yet, you really should. Afterwards, we genderfloomped at the Genderfloomp dance (tagline: F*** the binary. Let’s boogie). It was great to meet Apex readers and contributors in person, too. It’s always nice to put a face to the names, especially since I haven’t even met my publisher in person yet (that will happen at WorldCon). So, yes. Fantastic WisCon. Great weekend. Please send sleep and extra coffee. This entry was posted in 5 things, Apex Magazine, appearances, awards, Chicks Dig Comics, conventions, Editing, shameless promotion, tiptree award. Bookmark the permalink. 2 Responses to 5 Things: WisCon roundup, reading room renovation, and more. Still recovering from my test tube shots. Awesome party, folks! Read the sampler on the trip home and will be sharing the link. Thanks for everything. Glad you enjoyed both the party and the sampler!